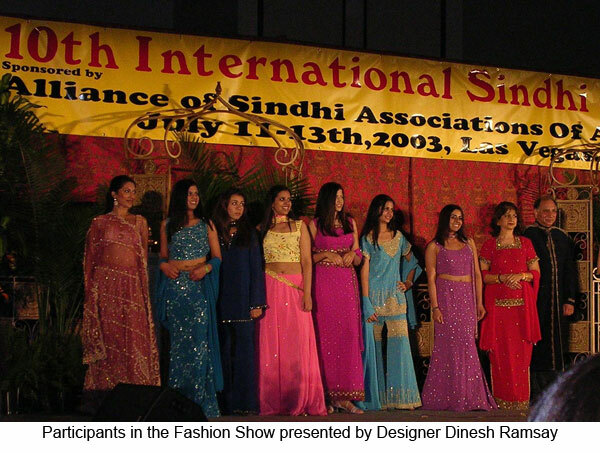 Alliance of Sindhi Associations of Americas Inc. hosted the 10th International Sindhi Sammelan at the Alexis Park Resort Hotel, Las Vegas, July 11 – 13, 2003. The theme of the Sammelan was “In Making of a Global Sindhi Nation”. 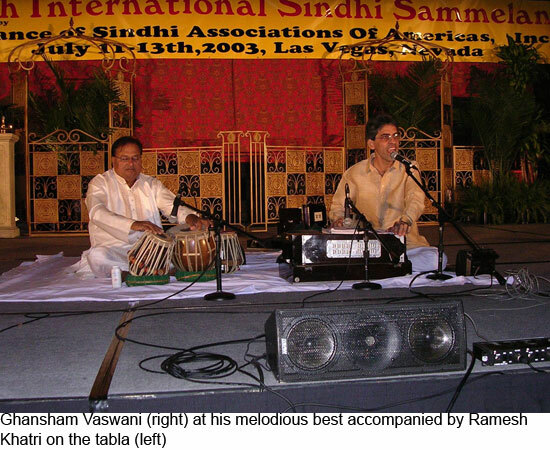 Ranjit Butani records in brief, his experience at the Sammelan. “Are you sure this portion is 1 plate meant for 1 person?” I asked the waiter as he placed the chicken sandwiches with fresh fries with an “enjoy your meal” – his suggestion to my request for a light meal after the long tiring journey from Mumbai through Amsterdam and Detroit. “Sure” he said nonchalantly. To me the portion seemed good enough for 4. And those how know me personally will acknowledge that in no way am I built small. Well – this is U.S. of A – everything on a grand and gigantic scale! Earlier when I had checked in I was disappointed in not finding the lobby bustling with Sindhis, but I realized that the diligent and workaholic Americans would attend work on Thursday and probably arrive in Vegas late night or early next morning. So I decided on an early supper to enable me to catch up on my sleep, get over the jet-leg and give my sore limbs a well deserved rest. Alexis Park is a beautiful Resort Hotel with lovely suits spread over acres of greens with 3 large swimming pools, a health club, restaurants, bar and conference halls. My suit was luxuriously furnished with all amenities – two heavy duty airconditioners, refrigerator, a large bar with a counter, seating arrangement and a large comfortable Victorian bed. I slept like a baby. Fit and fresh I walked into the lobby late morning and found it choc-a-bloc with Sindhis checking in. I spotted my friend Raj Daswani from London who’s the Chief Coordinator for the 11th International Sindhi Sammelan to be hosted 23 – 25th July 2004 by the Sindhi Association of UK in London. He updated me on his meticulous planning for this forthcoming event and I must admit that he has already got most thing organized to perfection. It was great meeting old friend and well wishers of ‘Sindhishaan’ like Prem Lalvani Chairman of Alliance of Sindhi Associations of America Inc. (ASAA), Vimla Tewari President ASAA, Kirhore Lala, Gope Gidwani – both Vice Presidents, Nand Belani Treasurer, Mohan Karamchandani and Gobind Bhojwani both Directors. One could sense the undercurrent of tensions being felt, attending to last minute hiccups and resolving 11th hour pinpricks that inevitably crop up on such occasions. Then it was time to exchange notes with other dear friends like Murli D. Tolani from Jakarta who’s been in Indonesia for over 50 years and makes it a point to attend the Sammelan every year; Nari Shahani – Staion Manager with Lufthansa at Saudi Arabia; Kamlesh Moorjani from Toronto, Roger Bijlani from Hong Kong and so many more Sindhi brethren. The sense of fraternity and sharing was truly intoxicating. The meetings I will fondly cherish forever were with, Bhagwan S. Gidwani, from whose book “Return of the Aryans” I never tire of quoting, Dr. Dayal Meshri, President / CEO Advance Research Chemicals, Inc who can teach most Sindhis the essence of humility and graciousness, and Khadim Hussain Soomro – Executive Director Sindhi Sufi Institute, Sehwan – Sindh, Pakistan who presented me with a couple of his books to take home. Well, now it was time for the proceedings to commence with the start of Registrations from 1 p.m. Then after freshening up it was time for social hour at 6.30 p.m. with snacks consisting of “pakoras” and “tikki channa” among others. The spread for dinner provided for “Elaichi ghosht”, “keema kaleji pao”, “bhindi masala” and other Sindhi delicacies. I however felt the Chef could have been a little less generous with the garam masala in most of his dishes. Nonetheless the native Sindhis simply went ga ga and enjoyed the Sindhi cuisine with great relish. The cultural evening began with a welcome address by Prem Lalvani followed by greetings from Bill Young – Sheriff Las Vegas, and John Porter, Congressman Nevada – who greeted the gathering with a ‘Namaste’ and concluded with ‘Shukriya’. Then it was time for song and dance. The performances put by the young American Sindhis were outstanding. The youngsters had really put their hearts into their acts; “Aaj kal ja chokra” – a dance performance by Padma Asnani and Krishna Israni; dance on ‘dola re dola’, of Devdas fame, by Sonya and Shana Jagwani which was performed with amazing verve and elan; dance on ‘Silsila’ from Devdas and ‘Sansanana’ from Ashoka by Kamini Shukla, Anjali Gidwani, Shobhna Mirchandani and Namrata Bhavnani; and then the Desi remix by Vineeta Jagtiani, Namrata Israni, Tian Jagtiani and Krishna Israni – all the acts had the crowds roaring for more. It was almost 10 p.m. and time to say good-bye to the youngsters. Of course they were not going to bad but to their won youth session Sindhi Viva Las Vegas with dance competitions and music by the top DJ’s from NYC! For us seniors, were lined up music selections by Pramila Bhatia and Kishin Alimchandani with Ramesh Khatri on the table followed by music selections by Dinesh Mirchandani. Thanks to the stage management and comparing of Kamlesh Moorjani the time schedule was adhered to a military precision. What could be better than starting the day with “Asa-di-var” and “Shabad Kirtan” at 6:00 a.m.? Frankly I found a better way of starting the day with a breakfast of ‘dal pakwan’ at 8:30 a.m. Well I needed the sleep to get over my jetlag, didn’t I? Day 2 proceedings began with a message from Dada J. P. Vaswani. 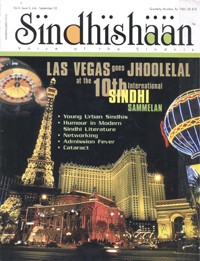 This was followed by an inspiring address by Bhagwan Gidwani, which Sindhishaan though prudent to publish in this issue, separately. Thereafter at about 11, I left the Convention Hall to spend time with the youngsters with whom Sindhishaan has been interacting over a considerable period of time. As such I missed the talk on Sindhi Sufism by Atma Advani and Khadim Hussain Soomro and the address by the Speakers Forum : Dayal Meshri, Murli Tolani and Mita Wadhwani. I have however managed to obtain a copy of Khadim Hussain Soomro’s address which is published separately and requested the Sammelan authorities for a record of the other talks. After a hearty lunch of ‘sai bhaji’, ‘besan bhaji’, ‘fish in green masala’ and lassi, none can blame me for returning to my suite for a siesta as it was impossible to keep my eyes open. The youngsters had however lined up a Hawaiian pool party “Sindhi Lau” with limbo contest and what have you, between 2 and 5 p.m. These are the times when you miss the glorious youthful days! It’s time to eat again after the siesta break and what do we have lined up! – “bhugo ghosht”, “chicken in palak”, “baingan varian”, “aloo and bhee”, “kulfi falooda”! Tremendous will power finally prevents me from satiating my greedy eyes and restrict myself to mini helpings only. I can’t go back to bed right away – now. And I pat myself on the back for the self-control exercised as the evening unfolded a memorable feast of events. After Vimla Tewari’s welcome speech it was the turn of Susan Ralston – Executive Asst. to Sr. Policy Advisor (Washington DC) and Congresswoman Shelley Berkley of Nevada to address the delegates and appreciate the contribution made by Sindhis to their adopted country followed by Proclamation of Sindhi Day by Council Woman Lynette McDonald of Las Vegas. It was then the turn of Chief Guest Srichand Hinduja to reiterate our being blessed with a rich tradition, spirituality, wisdom and vision. “The Indus Civilization” said he “also gave us the sense of compassion and philanthropy and taught us to share with and help the less fortunate. We were the first international traders and cross-border financiers, traveling across the globe and able to live with and be accepted by all cultures and communities.” He also expressed gratitude to Prem Lalvani for his foresight, vision and determination in establishing this Alliance, which should be the conduit for Sindhis to gain recognition by working together as one cohesive community with common objectives. By now it was 10 p.m. and time for the festivities to begin. As was the case yesterday, the youngsters had line up their own entertainment programme – “Sindhi Gras” with a Mardi Gras theme and left us to watch a unique fashion show presented by Designer Dinesh Ramsay. This was followed by Bhagat performance presented by Bhagwan and Nanik Chawla who had the audience in raptures followed by the soothing, lilting and melodious music selection by Ghanshyam Vaswani which had the crowds crying for more even at 2 a.m.
As was the case yesterday, I could not keep my appointment for “Asa-di-var” and Kirtans at 6 a.m. by made it for ‘Koki omelette’ breakfast at 8:30. After breakfast the checking out from the hotel by the delegates began initially as a trickle but then gaining momentum – yes come Monday and its Rise & Shine and got to be at work on time. 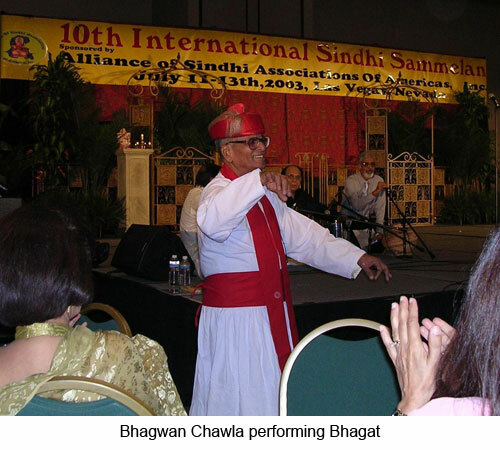 Not many stayed back to listen to Pramila Bhatia and Kishin Alimchandani and after the Beharana – Prem Lalvani thanked all the Committee members for their efforts and passed the baton to Raj Daswani – Chief Coordinator for the 11th Sindhi Sammelan at London next year. After heavy lunch comprising of ‘kadhi chawal’, ‘boondi’, ‘methi aloo’ and ‘keema peas’ with ‘moong dal halwa’ for desert, I retired to my suite after bidding adieu to all and promising to keep in touch and meet in London next year. I was to leave for Boston the following day and so called my host in Boston to give him my flight details, “Have you seen any shows in Vegas – have you been to the casinos – you can’t go to Vegas and not visit a casino or see a show!” I really had no interest, but as evening approached . . . . . . . did I go for shows and to try my luck at the casinos on the strip? Well that’s something personal and another story! I can only tell you that I managed to checkout at 7 a.m. and reach the airport in time to catch my flight to Boston, the next morning.